The Right Moment Band Duo is performing regularly at Luck Lou's In Wethersfield CT and the Bidwell Tavern in Coventry CT.
Donn Federowicz on bass & ukulele, perform classic rock, original music, and a wide range of musical experiences. 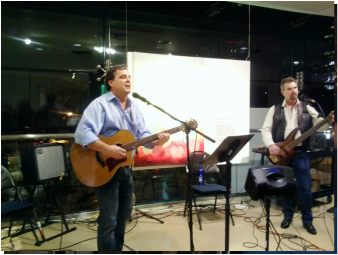 ​Patrons are treated to selections of their favorite Beatles, Train, Tom Petty, John Mayer, Crosby Stills Nash & Young, John Legend and other acoustic favorites along with Right Moment Band original songs. Donn Federowicz & The Right Moment Band Duo.